To import your content or list to Doppler, you must have a .ZIP compression software installed on your computer. If you don’t have one, you can download WinZip for free here. Now choose your list or the HTML file and all the images it contains, right-click on your mouse, choose ‘WinZip’ and then ‘Add to .Zip’. By doing this, you will create a ZIP file that you can import to our app for your Campaign. 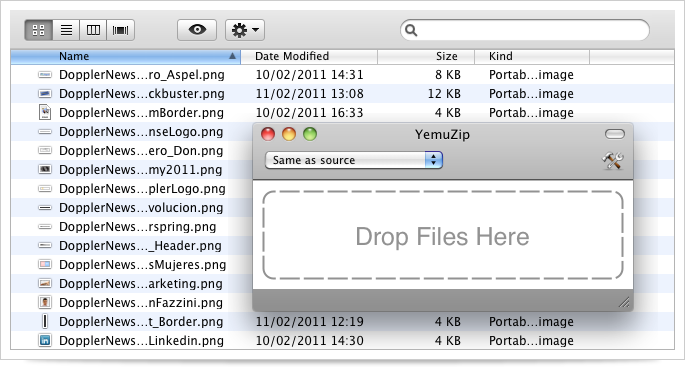 If you are a MAC user, you can* download a .ZIP compression software compatible with PC, like YemuZip. After you have installed it, select your list or the HTML file and all the images it contains and drag them to where it says ‘Drop Files Here’. * We recommend you to use YemuZip, because the native MAC file compressing app creates a folder within that prevents our app to recognize the file. Now go and rock you campaign!